Take time now to learn how to take care of strawberry plants in the wintertime outdoors for a bountiful crop next summer. Strawberries require winter protection, especially in areas where temperatures dip below 15 to 20 degrees Fahrenheit. Follow these essential tasks to give your strawberry plants the best chance of overwintering unscathed. Strawberries grow best when there is enough space between the plants. You should strive for approximately five plants per square foot (with more space given to plants that produce vigorous and plentiful runners). Examine the strawberry beds in the fall and decide which plants you can move or remove entirely. Look for vigorous growth near the crown or center of the plant. Any plants exhibiting crown rot, poor growth habits, or poor crown development should be removed. Transplant healthy plants to extend the existing strawberry bed or create new beds in the garden - or in containers. You can also give some plants away to a grateful local gardener; you're sure to find takers for healthy strawberry plants! Strawberry plants, their trailing runners, white blooms, and scarlet berries are unique additions to container gardens, window boxes, and ornamental displays. 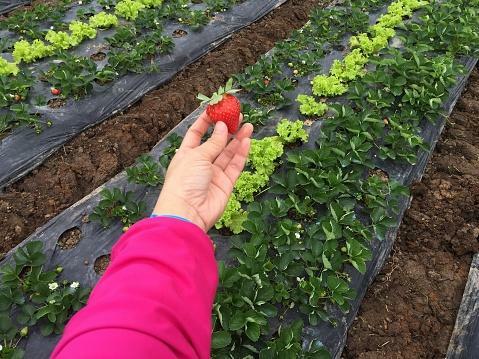 Strawberries, like many fruit trees and plants, determine the quantity of fruit they will produce based on the prior year's fall weather. Abundant fall rainfall is essential to vigorous fruit production. If your area doesn't receive at least one inch of rainwater per week starting in late September or early October, supplement the rain with irrigation. Gardeners in the northern part of the United States may need to begin watering earlier. Consider adding straw or salt marsh hay over the beds if winter temperatures can reach below about 20 degrees Fahrenheit. Strawberries, especially the tender new growth and crowns, can sustain frost damage during prolonged cold spells or unusual cold snaps. For regions above Zone 7, winter care for strawberry plants should include mulching. Apply the covering (spread a 2-3 inch layer of mulch) after the first significant frost. Many natural mulches - such as pine needles, wood chips or straw - are the best choices. Avoid manure and hay. Manure will "burn" plants and hay will yield a flourishing crop of weeds in the spring! Be sure to wait until the ground has received a heavy frost before mulching the beds. The ground should be frozen with sustained cold daytime temperatures - at or near freezing. Covering strawberry plants too soon may result in rot. Cover the plants before deep freezes, snow or ice. Some gardeners like to use row covers to protect strawberry plants, rather than mulch. A row cover is a plastic fabric draped over a frame. Use row covers made from a clear material in order for sunlight to filter through to the plants. Be sure to place a row cover over the plants when the weather turns cold, and to remove the fabric in early spring. Synthetic covers left on too long can cause the plants to become acclimated to the warmer microclimate underneath the cover leading to weather shock. If temperatures begin to warm prematurely, or the sun is heating the covered beds, plants can suffer from an increased possibility of burn, shock or fungal disease. 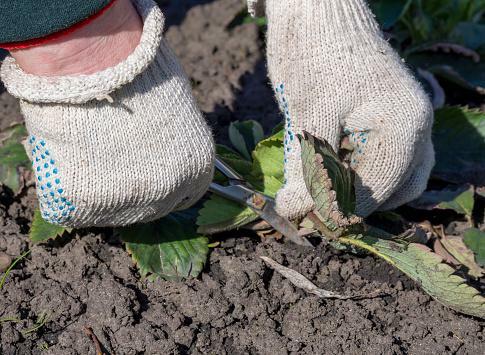 Winterizing strawberry plants includes selective pruning. However, in order to encourage regular yields from the plants, you will need to replant the beds or cull the old berries. The pruning you do depends on the type of plants you have. If you are growing an everbearer, dig out or mow the original plants in order to create new beds of purchased berries or to allow the rooted "runners" (new plants that grow from long, side-growing stems) to flourish. Everbearer types produce the best fruit during the first few years. Monitor the yields to decide when the plants should be removed. Small, yellowing or weakened plants with reduced fruiting are ready for replacing. June strawberries can set berries for several more years. Trim the plants by pruning off the old leaves, and the top levels of growth in the fall. Generally trim off the first 1/2 inch or more if the plant is overly vigorous. If you have large areas of beds (flat, not raise beds), adjust your mower to the highest setting and mow over the beds. This is done after berry production - around late August/September. Pruning encourages the strawberry to produce more fruit and it helps to mitigate disease. Strawberries are rugged plants, but they enjoy some extra nutrition in order to stay vigorous and produce heavier crops of berries. Fertilize the plants in the spring and the fall using a general 10-10-10 fertilizer. Follow the manufacturer's directions for application on berries. How much fertilizer you need will depend on your soil test results and the amount of other products you use (water soluble fertilizers and organic mulches/nutrients). Organic fertilizers are widely available for gardeners. You can augment purchased supplements with compost, lime, crushed stone and other degraded manures such as cow, earthworm, chicken, horse or rabbit. 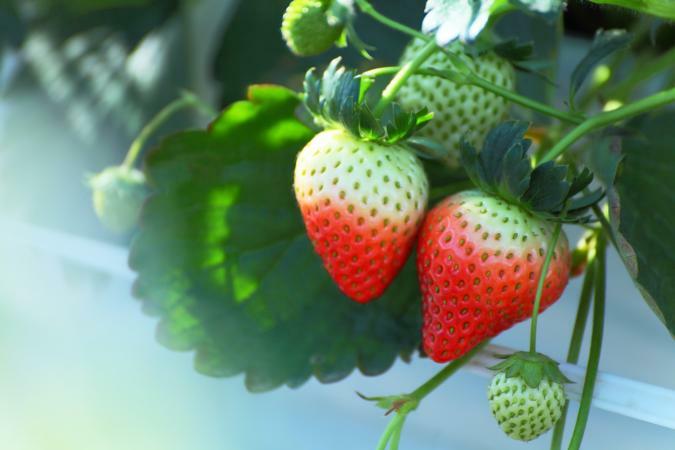 If you notice the strawberry plants are not producing well or are revealing yellowing of their leaves, it may be time to add a fertilizer product. If these symptoms are exhibited by older plants, cull the aging bed and replace the rows with new strawberries. Before planting the replacements, dig in some loam or compost to enrich the soil. 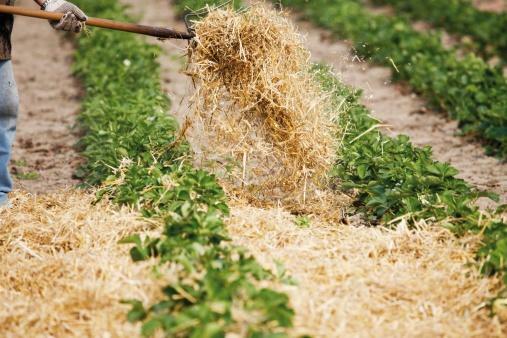 Mulch the new plants with straw or marsh hay. Luckily, strawberries are actually quite hardy plants, and can survive the winter very well. By following the simple winterizing steps, your plants will emerge in the spring - ready to flower and fruit!